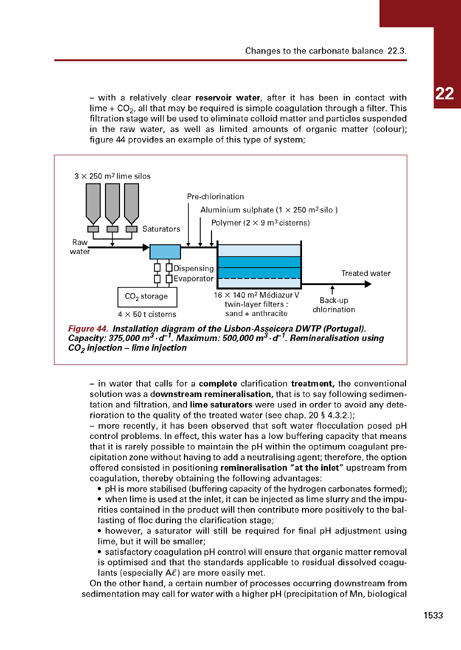 The object of this chapter is to show how «treatment train» arrangements combining a range of technologies can be used to process the most difficult fresh water source to render it potable, bearing in mind that brackish water or seawater desalination was reviewed in chapter 15 § 4.2. The reader is invited to refer to chapters 3 and 4 for an outline of the theoretical principles pertaining to the physical-chemical and biological treatment processes utilised and also to the chapters describing the various Degrémont technologies, in particular: settling tanks - flotation units (chapter 10), filters (chapter 13), membranes (chapter 15) and oxidation-disinfection (chapter 17). groundwater «under the influence of surface water», intermediate amongst the first two categories, this group includes very shallow groundwater sources, water in karstic systems..., and is often clear but susceptible to rapid deterioration from turbidity and all the other contaminants found in surface waters and deep groundwater sources. Note: a fourth category can also be identified: wastewater recycled for human consumption, usually indirectly (injected into aquifers, into water reservoirs to be processed into drinking water...), bearing in mind that this type of water contains certain pollutants from categories 1 and 2 and that synthetic pollutants play a very important role. One also needs to recall that the main treatments applicable to this category of water tend to be those described in chapters 11 and 24 (biological treatment) or 15 (membrane separation). Therefore, to render water potable, there exists an entire range of technologies of which practically none are truly specific to any of the pollutant types referred to above. This is illustrated by table 1 where the X's denote the processes that play a major role in the elimination of a particular type of contaminant and where x's denote a process that contributes to said elimination but as a secondary property. As already emphasised, the processes and technologies outlined in table 1 vary widely in terms of cost (capital investment and operational) as well as operating limitations and performance. Consequently, defining an optimum treatment train continues to form part of the «craft» of the Design Engineer with many examples highlighted in this chapter. 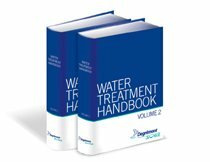 Note: although residuals handling (sludge, saturated adsorbants, membrane backwash waste...), with or without preliminary treatment, is not covered in detail within this chapter, it remains an integral component of the overall cost and must therefore be considered when selecting the optimal treatment design. This table highlights the noteworthy effectiveness of clarification and/or desalination membranes, explaining the increasing tendency of water treatment specialists to recommend them either to replace conventional treatment strategies (filtration of karstic water, disinfection), or to supplement conventional treatment as part of a more advanced system to process more heavily contaminated water. Depending on the properties of the water to be treated and the effectiveness of a given process, the water specialist will thus be able to group each elementary «stage» into what is commonly referred as a «treatment system».